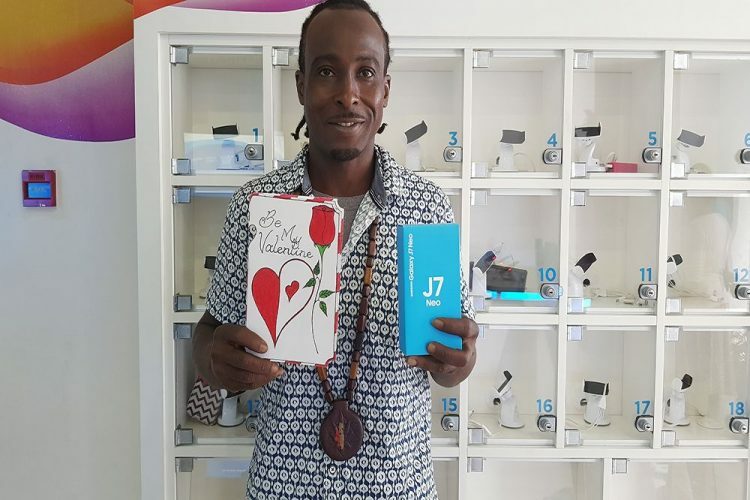 Telecommunications company Flow received much love and appreciation on Valentineâs Day from its valued customers, as Timron Padmore of Rillan Hill was announced the 2018 Valentineâs card making competition winner. Padmore, who hails from a creative background, being involved in arts and craft, stated that Flow was the inspiration behind his winning card, which is labelled âBe my Valentineâ. He said he thought it appropriate to create the card in Flowâs honour, as the company is always thoughtful of its customers, highlighting the scores of activities and initiatives it supports. Padmore stressed that Flow also deserves to have a Valentine. He further sang praises of the promotion, stating that it is an uplifting competition, as it is a way of further instilling the arts in the nationâs youths. He said he learned about the Valentine card making competition when he was at the Flow store making bill payments and saw other persons participating in the activity. He noted that he was further prompted by other customers to try his hand at it. Padmore, a landscaper by profession, confirmed that he does celebrate the day of love. He is the winner of a free Samsung Galaxy J7. Expressing his excitement and gratitude, he said that his winnings are timely, as he was experiencing some challenges with his previous handset. This is the second consecutive year the company is hosting the competition, Rondell Dickson was the 2017 winner.